What’s with the new cover picture on Sunrise Burners? First, I was tired of the old one (as much as I love the aerial shots of BRC, that one’s been up for the entire life of the blog). But the more important reason for me was to remind myself that Burning Man is all about the art – and no piece was more memorable from 2013 than Truth is Beauty. 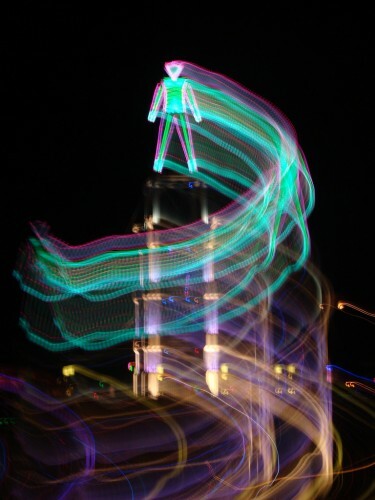 It lorded over the playa, visible from almost everywhere, and had that magical quality of repose during the day that morphed into a lively spirit after dark, when it’s complex lighting system was activated. Sometimes I feel a sense of frustration when I see a piece of art as magnificent as Truth is Beauty – frustration that I have never created art, and haven’t even written much that will outlast me (not that many of the corporate Annual Reports I’ve written and edited won’t be accessible forever on the web; I just don’t count that as art). But this wonderful sculpture had a different effect on me. It was uplifting – almost spiritually so. It gave me constant pleasure and joy with no sense of disappointment. So I decided to make it the new header for Sunrise Burners. Hope you like it as much as I do. Truth is Beauty is a perfect representation of Burning Man 2013, which was brimming with art – whether in the form of sculptures, structures or vehicles. It was a banner year for art, and almost impossible to see it all. We’ve committed ourselves to getting to more of the art installations in 2014 and trying to make one of the art tours this year. I’ve read a few comments regarding my blog on how most Burning Man films and videos show only the young and the beautiful, ignoring the core of us older, saggy types. It’s certainly understandable when a filmmaker edits around the “average” people and settles on the many beauties that come to the burn, but we’d love to see someone go a different direction and show the full range of burners. Maybe it would work for an artist to create a film or photo book of older Burners. That way, comparisons wouldn’t make us look worse. Seriously, such a work could bring out the beauty of us older folks, and show the way for other senior burners to give Burning Man a try. Such a book or film may already have been made, so if you know of one, please add the info as a comment below; but if it hasn’t been done, then I’d urge one of our many artists to give it a try. I haven’t said this often enough, but I am deeply appreciative of those of you who read this blog. It is meant as a gift to the Burner community (you’ll never see any advertising or other forms of commercialism on this site), especially to those of us who are 50 and over. But it’s also meant to help younger Burners convince their parents to give Burning Man a try. There’s nothing quite as rewarding as sharing Burning Man with your children. We’ve never had a Burn without at least one of our children there. We don’t feel the need to do everything together, but we do try to see each other at least once a day. The kids like to come by our RV just to make sure we’re okay (we always are); we like to visit them just to revel in the joy they’re experiencing (and also to make sure they’re okay – sorry, I’m a parent). So I’m eagerly awaiting Burning Man 2014, and I’m still trying to figure out what the theme means to me, and what kind of flag we should make this year. We hope more of you come visit us. I expect to be back in Lamplighter Village this year, and anybody in the village will be happy to point out Perky and Lashes’ RV. See you at BRC.